This wartime story in picture book format is a tribute to a courageous Polish man named Anton Suchinski who saved the lives of six people by hiding them in an underground cellar during the German occupation of Poland in the early 1940s. Although he was very poor and considered strange by many people in his village, Anton had a profound respect for life and proved his intelligence by successfully harbouring some Jewish neighbours for a year when the Nazis were rounding people up. 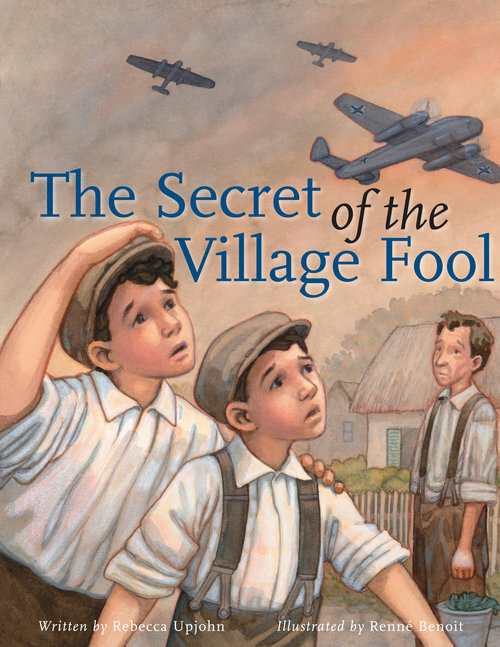 The story is told from the perspective of two young brothers who survived the war because of the kindness of “the village fool.” Beautiful, evocative illustrations painted in a subdued palette mirror the tone of the story. Classroom Connections: This picture book introduces a very difficult topic to young children. It could be used to explore themes of tolerance and acceptance of different beliefs and customs within a community, and discrimination on a larger scale using the holocaust as one example. Because it is a true story and provides photographs of the people involved in an Afterword, young readers will be likely to make connections to their own lives and families. This review is from Canadian Teacher Magazine’s Sept/Oct 2012 issue.